When it comes to issues involving a home or office building, homeowners and business owners often think that they have the skill and knowledge to tackle projects on their own. DIY or do it yourself is a common phrase used today. While there are many cases where somebody taking on a household project is acceptable and well within their abilities, it can be a very dangerous undertaking when it comes to mold. Mold can be a very serious indoor contaminant. While some types of mold bring out mild to severe allergies and asthma, toxic forms of mold can cause bronchitis, infection of the lungs and other serious respiratory conditions. When mold is discovered inside of a property, the first reaction is to wipe it down with a common household product such as bleach or a mold and mildew removal (such as Tilex or Chlorox Bleach). Note: Bleach and other regular household chemicals often do not not completely kill mold. These chemicals are not a registered or approved eradicators of indoor mold with the Environmental Protection Agency (EPA). Ineffective product names include Clorox, Tilex, X14, Lysol, Comet, Mold Armor, and Arm & Hammer. Another reaction is to cover it up with a fresh coat of paint or other new building material. This is known as “quick cover-up” or a “tear out and replace”. Whether performed by the owner or an everyday construction contractor, these solutions can have serious consequences. Covering up the visual mold or water damage problem while the environment still remains dangerous. Failing to address a potentially deeper, more hidden mold problem. Not addressing the moisture source that caused the mold issue to begin. 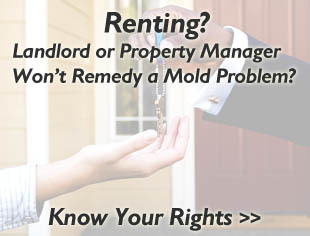 Spreading harmful mold spores throughout the air of the property. 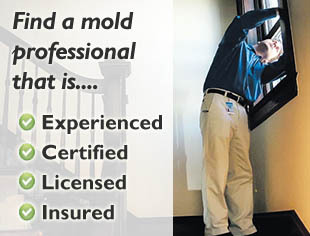 When mold is found at your property, whether you own or rent the property, and you have any concern about it being a health issue, contact a professional to assess the property before taking any action. Spencer Cliff is a research scientist in the Department of Microbiology at New York University School of Medicine.